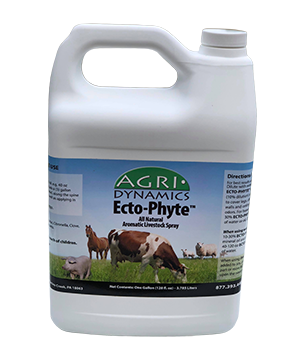 The ECTO-PHYTE™ formulation is based upon the aromatic compounds found in essential oils. These oils are rich in terpenes, aldehydes, cineoles, esters and alcohols and are very antagonistic to both the adult and larval stages of insects. Upon contact with the animals hide, the body temperature volatilizes these molecular compounds and creates a vapor around the animal. This vapor acts as an aromatic shield. Parasites such as lice which live their entire life cycle, egg through adult, on the animals’ hide are immobilized by these aromatic compounds thereby interrupting the pests’ cycle and eradicating the problem. The formulation is both oil and water soluble. The dilution rate and frequency of use are dependent upon the amount of infestation and the level of ambient temperature. Elevated summer temperatures with high fly populations require a more concentrated dilution and daily application. We feel it’s more cost effective to deliver the product via a livestock oiler. External parasites such as lice can be easily controlled by spraying livestock thoroughly with a mild to strong dilution with oil (depending upon the level of infestation). (NOTE: There is a strong correlation between malnutrition and internal toxicity and the severity and incidence of external parasites). Dilute with water or oil (or a combination of both) to make up to 12 gallons of finished product. Can be used in livestock rub oilers and back-pack sprayers. Suitable for application directly on livestock and stall/parlor areas.